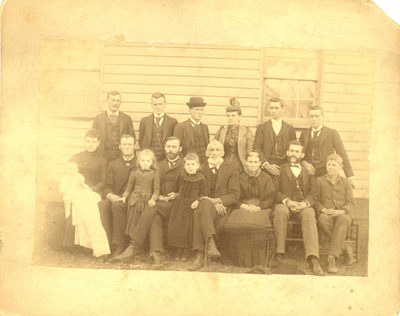 Seated l to r: Laura Cherry holding daughter Ethel, Isaac Cherry, Emma Cherry, Jeremiah Cherry, Mary Cherry, George Cherry Sr., Martha Cherry, T.C. Cherry and Ithiel Cherry. Standing l to r: W.B. Cherry, Henry Cherry, John Cherry, Mary Withers Cherry, George Cherry Jr. and Redford Cherry. George Washington & Frances Martha (Stahl) Cherry had nine sons. The sixth was Thomas Crittenden aka T.C. born 1862 and the seventh was Henry Hardin born 1864 on a farm about ten miles west of Bowling Green. Both boys attended the Southern Normal School, became teachers. In 1892 the two purchased the Southern Normal.